Shirdi Sai Baba Stories,Leelas and Teachings. : God Is One-Download Screen Saver. Last year, on the occasion of Gurupurnima, I had uploaded a beautiful Screen Saver created by talented artist Shri R.Kouwshigan ji .The screen saver was appreciated and liked by all.Shri Kouwshigan ji has created another beautiful screen saver for the upcoming auspicious day of Gurupurnima.This screen saver has the essence of Baba's teaching that God is one and all the religions are different paths to reach HIM. Devotees who wish to download the wallpaper and/or screen saver can do so by downloading it from the download links given below . 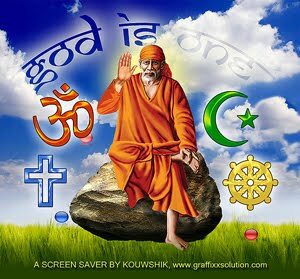 I thank Kowushigan ji for sharing this wonderful screen saver with all Sai devotees. Jai Sai Ram .